This page seeks draw a timeline for the top end of Australia as a matrix against which to attempt to evaluate the increasingly exuberant claims for the earliest occupation of Australia in the sport of 'My occupation shelter is older than your occupation shelter'. 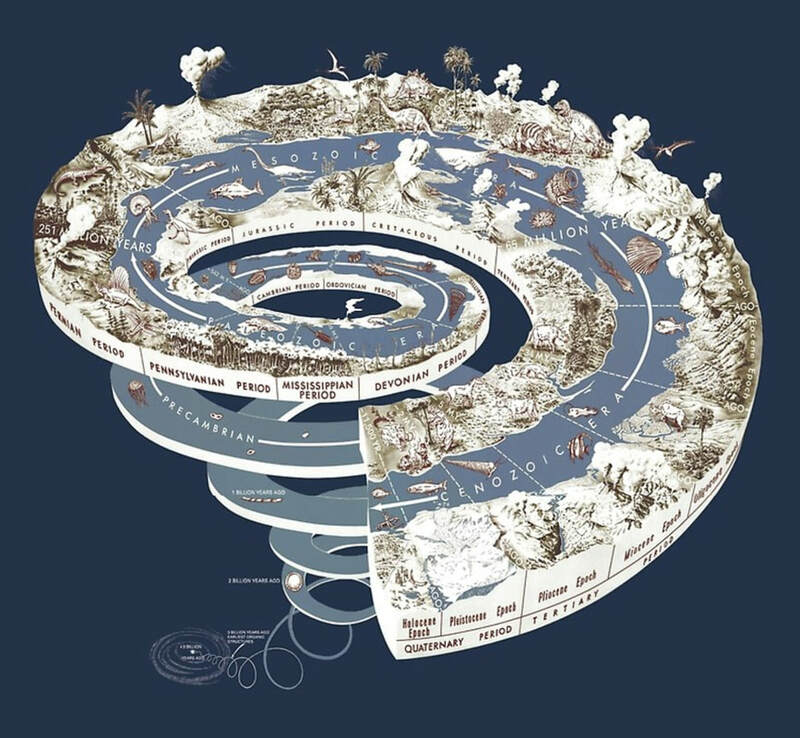 A simple chronological framework of major geological & climatic events which predicate the movement of people into Australia. Where possible graphic examples of cyclical geomorphological processes which resonate through the millennia & manifest in every tide. Ice Ages - are periods of extreme cold occurring between 2.4mya to 11,500mya. Glacials - are the cold periods and the warm periods are Interglacials. Glacial Maximum is the height of the Ice Age when the ice is of greatest extent - sea level lowest - land is driest. Greenhouse Earth - Tropical temperatures extend to the Poles & no ice sheets. Icehouse Earth - Some permanent ice - the extent of which varies greatly. Snowball Earth - Ice covers entire planet. 3.2bya - Magma Chamber solidified on South Adelaide River Floodplain. (2.3 billion years) the oldest exposed rock in the NT. Might be 2.3 can't remember. 2.4bya - HURONIAN ICE AGE begins. (2.4 billion years ago also 2.4Gya) during the Siderian & Rhyacian Periods of the Paleoproterozoic Era. Aslo known as the Huronian or Makganyene Glaciation - it was the earliest and longest Ice Age. It was precipitated by the Great Oxygenation Event (GOE) which increased Oxygen & decreased Methane in the atmosphere. Oxygen & Methane combined to form Carbon Dioxide & Water - which hold less heat. 2.4bya to 2.3bya - Snowball World - entire planet covered by ice.​ This may have caused the 250ma pause in volcanic activity - reducing atmospheric CO2 & reducing the Greenhouse Effect thus prolonging the freeze. 2.1bya - HURONIAN ICE AGE ends. 850mya - CRYOGENIAN ICE AGE begins. (850 to 630mya NS) 200ma deep freeze - possibly including periods of Snowball Earth. ​630mya - CRYOGENIAN ICE AGE ends. ​550mya - Arnhemland Plateau of sandstone began to form as river silt from mountain range to NW. Sunset over 500myo Mission Beach on Elcho Island showing ripple rock & tracks of small sea creatures. Ancient wave action was from the West. 490mya to 445mya - ORDOVICIAN PERIOD - most land part of Gondwana Land at the equator - most areas ocean outside the tropics. ​460mya - ANDEAN-SAHARAN ICE AGE begins. Second largest mass extinction. 445mya - ORDOVICIAN PERIOD ends. 430mya - ANDEAN-SAHARAN ICE AGE ends. ​359-318mya Mississippian Period peak period of ice formation - Glacial Maximum. 318-299mya Pennsylvanian Period ​peak period of ice formation - Glacial Maximum. ​250mya Permian Extinction - the most severe. ​7mya - human ancestors walked upright - between 5 & 7mya. 'During the first two-thirds of the Quaternary, the ice advanced and retreated roughly every 41,000 years – the same tempo as the changes in the tilt of Earth’s axis. About a million years ago, the ice switched to a 100,000-year cycle for reasons that were until recently a mystery. Now more detailed information about the timing of the ice’s movements may have helped glaciologists find an answer. To make matters more complicated still, the ice didn’t advance and retreat simultaneously all around the world. Often it would begin advancing on one continent, with the others only being covered thousands of years later, and then linger on a few continents several millennia after it had disappeared from the others. ​2.3mya - Homo Sapiens evolved - earliest flaked stone tools. ​2mya - humans spread out of Africa. ​250kya - Woolly Mammoths appeared. 190,000ya - Glacial Maximum - opportunity for humans to come into Australia. 120,000ya - Glacial Maximum - opportunity for humans to come into Australia. The last time sea level near (slightly above) current level. 45,000ya - Glacial Maximum - LATE PALEOZOIC ICE AGE - opportunity for humans to come into Australia. ​22,000ya - THE QUATERNARY ICE AGE - Start of the latest Ice Age. 18,000ya - Last Glacial Maximum (Europe 20mya NS) when sea level at its lowest c130 metres below current levels - 120kms north of Darwin. Dr. Tim Stone beside band of red relict Pleistocene Dune - builder's sand - in the Galiwin'ku quarry. ​12,800 to 11,500ya the Younger Dryas Glaciation froze Europe for many months shutting down Atlantic 'Conveyor-belt Current' - meteorite also cited. 11,700ya - PLEISTOCENE EPOCH ends - termination of Weichsel Glaciation 11,711ya WIKI - just after little lunch on Thursday 27 February. 11,700ya - Beginning of the Holocene Epoch - our current period - which is the second of the Quaternary Period. 4,000ya - Flood Plains form - Dingoes arrive. ​8,000ya - sea level stabilises at current level. 8,200 Years Event - Collapse of the last major ice wall - north America that triggered the failure of the ice wall in the English Channel that drowned Doggerland which is now the floor of the North Sea. Is there any sign of this here? ​10,000ya - Last Woolly Mammoths died out in Siberia. ​1,623AD - Torres Strait western entrance described as 'a dried up river mouth' by Dutch VOC expeditioners aboard vessels Arnhem & Pera. There are four Geologic Eons - the Phanerozoic - Proterozoic - Archean - & Hadean. ​Phanerozoic Eon 540 to 250mya, the earliest & longest - has six Geologic Periods - Cambrian - Ordovician, Silurian, Devonian, Carboniferous & Permian. The Pleistocene Epoch was the first of two epochs of the Quaternary Period and the sixth of the Cenozoic Era 65mya to present. We are in the Holocene Epoch.